Drowning is one of the leading causes of non-natural death in the region, and we’re often asked for advice on how to keep safe around water. Here are some common-sense tips. Have a healthy respect of water courses. They will contain many hazards which you can’t see, and even the best swimmer can become tangled and exhausted. Rivers often contain currents and water movements which you cannot see from the surface. 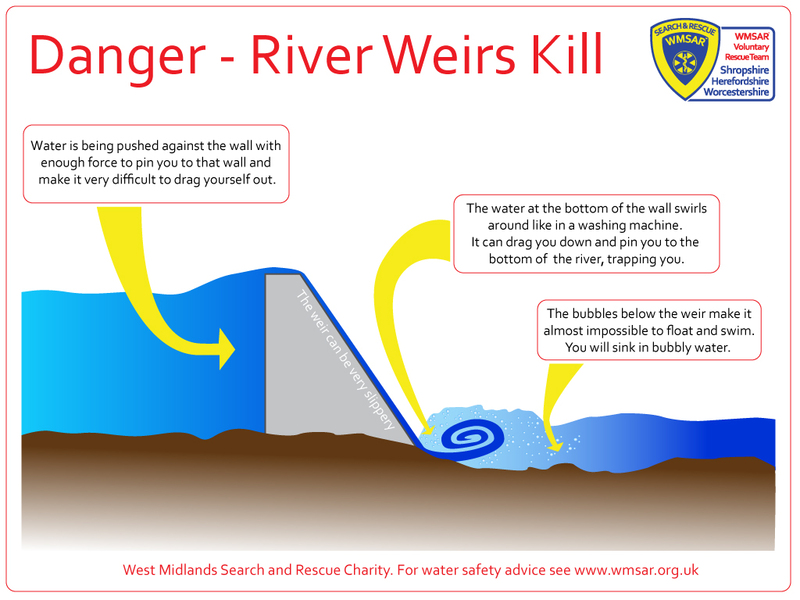 Never enter a watercourse upstream of a weir, lock or fall even if you are a good swimmer. If the water traps you in a swirling, washing-machine type trap you may not be able to escape. Never enter the river if you are alone. If you drop something in and need to retrieve it, get help first. 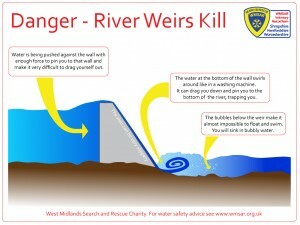 Never play on or near a weir. They may look pretty, but under the surface the water is extremely strong and violent, and can trap you with no escape. In Summer, rivers and lakes can be very cold where they get deep. You can get hypothermia, which makes it very difficult to swim, even on hot days in deep water. A lot of our rivers have sudden, deep drop-offs and craters in them. Wading across what seems like a waist-deep river can be very dangerous. River rocks can be extremely slippery. Wading across even shallow rivers, or using stepping stones, should be done very slowly and with poles or support. Rivers change. Even if you know a spot well, the weather can change it with new obstructions, currents and changes in flow. It’s almost impossible to stand up in waist-deep water travelling at 4mph. Throw a stick in a river – if it’s moving as fast as you walk, you can’t stand in that river. Faster flowing water is deadly. If it’s over your ankles, fast-flowing water can knock you over and you won’t be able to get back up easily. Please report any damaged or missing life preservers / life-rings. Don’t assume that someone else has reported it. Alcohol and rivers are a very dangerous combination. If you have a friend who has drunk, steer them away from any water. Young males are especially in danger from this combination, so look out for your mates. Flood ‘water’ can be a mix of water, sewage, oils, chemicals, waste and solid objects. Don’t go in to a flood unless it is absolutely critical. And if you do contact flood waters, wash and disinfect yourself as soon as possible. Never drive through moving flood waters – 1ft deep flowing water can pick up and move a car. Never cross a ford if it is flowing fast, or is unusually deep. Avoid driving through ‘still’ flood waters. Even a Land Rover Defender only has a wading depth of 20 inches (50cm), and most cars can be damaged by water much less deep than that. If you absolutely have to walk through flood waters, use a stick to prod the ground in front of you and walk very slowly. Manhole covers can be lifted and missing, and underwater hazards are frequent. If you see anyone in life-threatening danger from water, rivers or floods, call 999 and ask for the Fire Service. Shout to them “Here. Swim to me!” To give them something to focus on. Summon help. If they’re drowning, they may not be able to shout for help. Look for a long branch, life ring, pole or something to reach out to them. DO NOT lean out over the water to reach them – they’ll probably pull you in. Look for something which floats that you can throw to them – to help them stay afloat. DO NOT enter the water to save them.